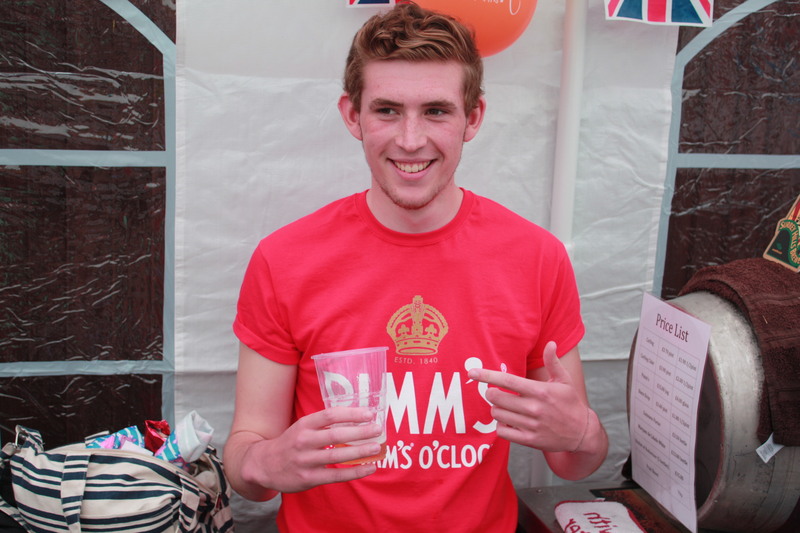 Once again, a massive thank you to everyone who came to this year's Party in the Pub on Saturday 18th August and helped us raise a whopping £2,440 for Dom's Wheelchair Fund and Shine Surrey, a organisation supporting people with Spina Bifida in Surrey and South West London. From showcasing the best DJ's and local singers to a member of bar staff having has beloved locks shaved off to be left with a mohican. Even the good publican in the sky blessed us as, for the first time in many years, it stayed dry. Dom was in attendance proudly showing off his new all-terrain wheelchair and along with Sarah, Andrew, Jon and Sylvia, the volunteers from Shine Surrey, they were busy selling raffle tickets. Liz Tadd, fundraising co-ordinator, of Shine Surrey said "Thank you so much to the wonderful patrons of the Wheatsheaf. The amount coming to Shine Surrey is magnificent and exceeds all of our expectations". Dom added "I've been overwhelmed by the generosity shown by the Wheaty. From running to quiz nights and raffles to hosting Party in the Pub, I can't thank everyone enough for allowing me to fulfil my dream of going to next year's World Scout Jamboree". Big Boss Kim was delighted with the success of the day. She told the Wheaty Weekly "I thought this year's was the best and there are so many people to thank including all our star acts, DJ Em, Adam, Emyr, Emma and Bobi. 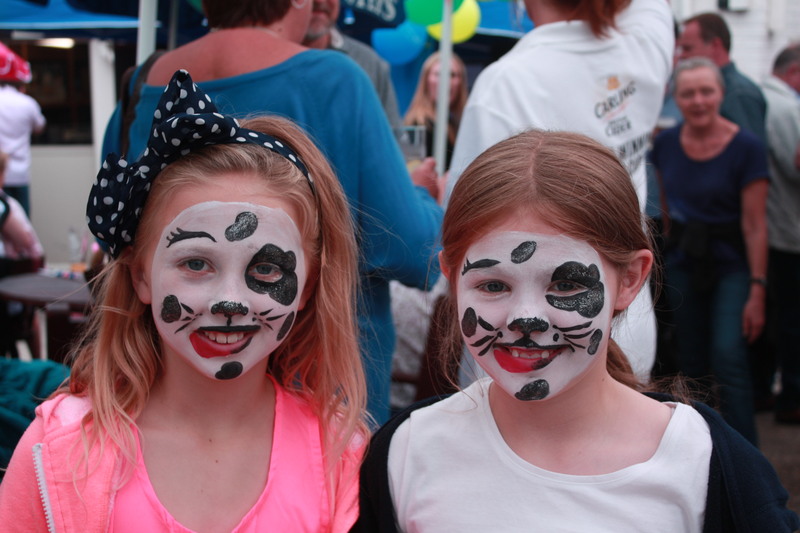 To Kerry Clark for all of her hard work on the face painting stall, Natalie Gray for assisting with the barbecue. Lorraine O'Leary for agreeing to shave off Luke's hair and to Luke for agreeing to take part and to all of Team Wheaty for all their hard work in setting up the day and their sterling efforts behind the bar. Finally, a very special mention to Graham Adams for raising £420 for Dom's cause riding in the Prudential London Bike Ride back in July". 2017 PARTY IN THE PUB - THE WHEATY WEEKENDER! A massive thank you to everyone who came to Party in the Pub or our Wheaty Family Fun Day and supported the bands, the singers, the dancers, the stalls, the DJ and bought raffle tickets. We raised a whopping £3,000 for the Royal Brompton and Harefield Hospitals Charity with money still coming in from promised donations and our on-going auction. PITP 2017 was truly a record breaking year with more money being raised than ever before, more rain falling than any other year, a new record set for the the most amount of people huddled under a gazebo during a downpour and the most amount of balloons being released in Ewell's biggest balloon race. The day started in glorious sunshine with the weather forecast seemingly set to improve throughout the afternoon. Weather apps were being checked with even some young Wheat-tots having sun cream applied to their fair faces. The fantastic singers and bands from the Realistic Music Academy were performing on the Wheaty stage, balloons were being released at a frantic pace and the brilliant BBQ team of Julie and John Harper were busy selling burgers and hot dogs. 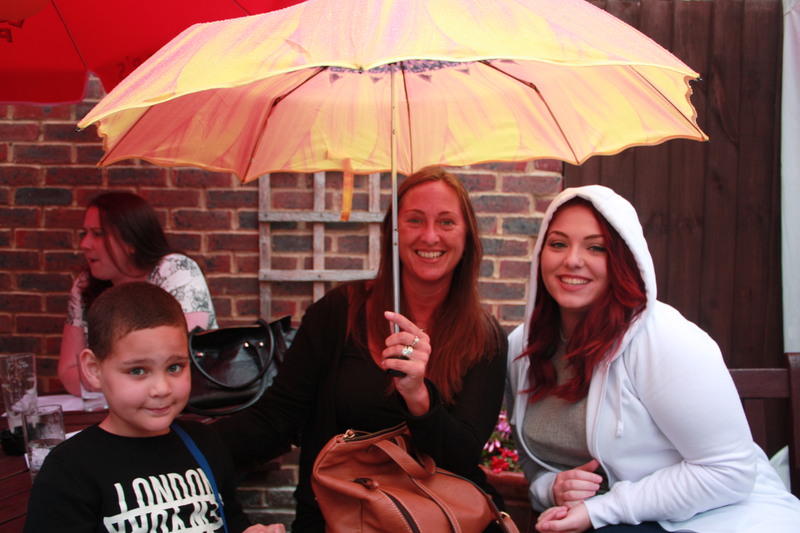 When the monsoon rain arrived around 4pm it didn't dampen the spirits of everyone present. Primarily down to the Jade Tedaldi, Velvet Cage, Ella Cornwell, The April Project plus Toy and Rob who entertained the Wheaty revellers during the eclectic weather conditions. Around 7pm we opened the Wheaty dancefloor in the pub with the fantastic Emyr performing his first set to a carefree and slightly inebriated party crowd. The brilliant Emma Morris followed with her set of swing and party classics before Emyr returned to the mic to close Party in the Pub 2017. The radiant Kerry Clark had wowed her charm on those still partying by selling out 'Guess how many Marbles in the Jar' before the Belgique legend DJ Hugo Eduardo took to the decks for the PITP after-show party. Peakey and Pin-up introduced the Saturday night merrymakers to the 10 o'clock shot whilst the lads from Wheatsheaf FC danced their little socks off to the club classics and sing-a-long anthems being dropped by the elder statesman, Hugo. PITP takes a lot of hard work behind the scenes and we can't thank everyone enough for their contributions in making the day a great success. A special thank you to Julie and John Harper for manning the barbecue throughout the whole weekend, Kerry Clark for selling the treasure hunt, face painting, marble selling and just about anything else we could throw at her, Dave Gray for running the ale bar, Joe Savva for selling raffle tickets, Paul Savva for his speeches, all the acts that performed and finally to Team Wheaty for all their hard work ensuring that everyone's glasses were always topped up. Some 7 hours after locking the door on the early hours of Sunday morning, Team Wheaty returned to the best little pub in the village for our Wheaty Family Fun Day. 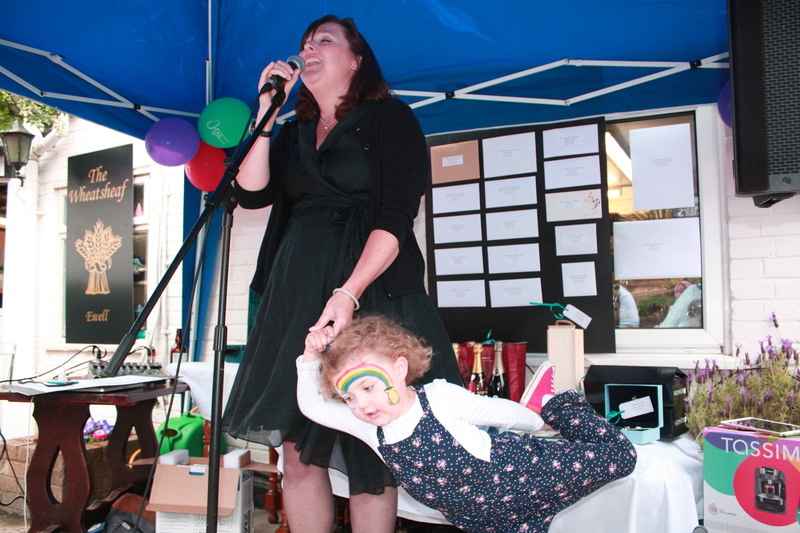 We set up a village fete in our beer garden and arranged a day with the little people of Ewell in mind. Mums, Dads, Nans and Grandads were entertained by the dancers from the KGK Academy of Irish Dance before DJ Crazy Chris (trust us, he was crazy) from DNA Kids Disco entertained the junior Wheaty ensemble with party games and dancing. Once again, we raised funds for the Royal Brompton and Harefield Hospitals Charity with those attending generously helping us fight the world's two biggest killers, heart and lung disease. Our sincere appreciation to JJ and the Irish dancers for opening the show and thanks again to our fantastic team of volunteers including Chris and Vince, Nanny Beryl, Two Pint Tommy, Jean and Dave, Kerry, Julie and John, a reluctant face painting Wendy and Gavi guzzling Gazza. A special mention to Big Boss Kim who, in all honesty, put the whole weekend together. Landlord Darren comes up with these mad ideas but Kim is the one who puts all his daft plans into practice. If we include the £1,495 that we've already raised from our fund raising activities earlier in the year, we're on target to donate over £5,000 to our nominated charity. A fantastic achievement for a little village pub. Our mission was to party like the Wheaty had never party'd before and as you'll see from the video that we've put together for you, our mission was achieved! Despite two torrential downpours, fobbing beer as a result of the cellar cooling unit breaking down and the remote cooler blowing up, we still managed to party for twelve hours from midday to midnight. A massive thanks to everyone who came along to Party in the Pub 2016 and for your generous support in raising a whopping £1,800 for the Epsom Riding for the Disabled. We said that this year would be bigger and better than ever and, it's fair to say, we delivered. The 10 bands supplied by the Realistic Music Academy were all awesome and in the evening we danced our socks off to the fantastic Nikki Aston and the brilliant Emma Morris. We really hope you enjoyed the day and the feedback we've received from our regulars and many new faces is that it was the best Party in the Pub ever. Check out our video link below and you might just see yourself busting some big shapes on the Wheaty dance floor or looking silly in our outdoor photo booth. A huge, massive, enormous, gigantic thank you to everyone who came to Party in the Pub 2015 and supported the St. Helier & Surrey Kidney Patients Association (SHAK). We raised a wonderful £3,250 for the charity which will go towards improving the facilities and welfare of Kidney patients under the care of the renal unit at St. Helier Hospital. We are still fundraising in the pub with another £500 draw in progress plus we've left all the SHAK collection boxes on the bar so it's not too late to donate. The day started in the glorious sunshine with Wheaty favourite, Josh Bolt, with another wonderful performance of swing from artists such as Frank Sinatra, Dean Martin and Michael Buble. Our cunning plan to book Josh to open the Party didn't disappoint as by the start of his second set there was standing room only in our courtyard garden. 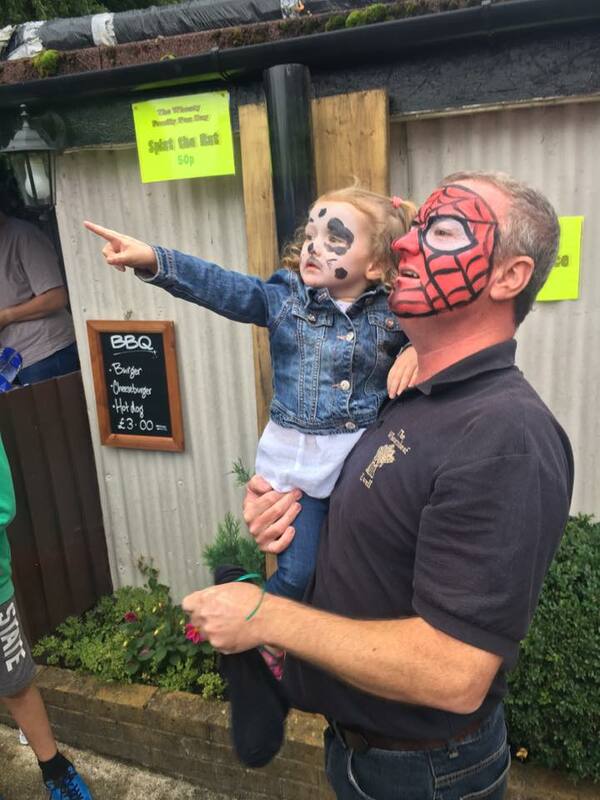 Our brilliant face painting team of Kerry, Ella, Candice and Dee were kept extremely busy with butterflies, rainbows, cats, mice, spiderman and Dalmations being applied to kids faces (and some grown ups). The kid's play area was packed to the rafters and Nanny Beryl was hard at it selling kid's lucky dip, name the teddy and guesses for how many sweet in the jar. Next up behind the mic was Wheaty debutant, the sensational Emma Morris. Emma opened her act with a few well known numbers from musical theatre before belting out a rendition of Frozen's 'Let It Go' that went down a storm with the Mum's and little ones. Emma then got everyone on their feet for a set of girlie anthems accompanied by daughter and future Wheaty superstar, Millie. We've received an amazing response following Emma's performance and we'll be asking her to come back to the Wheaty to sing for us again. 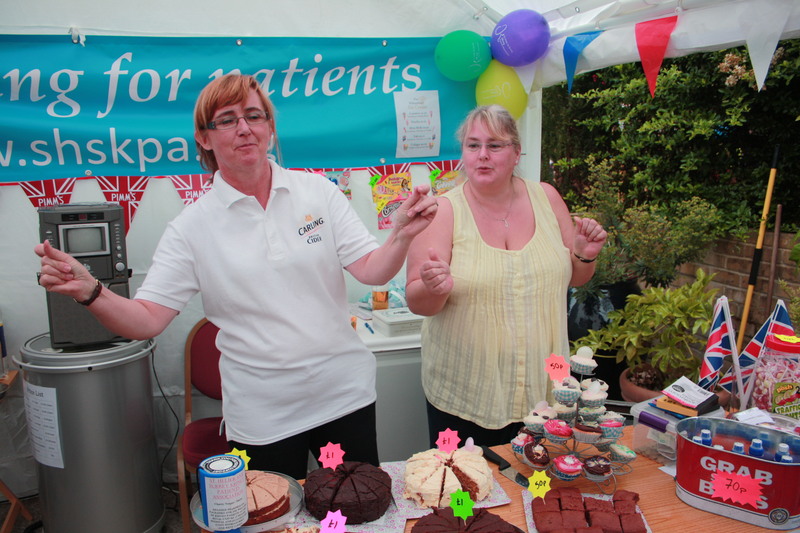 Throughout the afternoon the garden got busier and busier with Christine and Wendy busting some moves whilst selling cakes, ice lollies, raffle tickets and sweets alongside Vince who served jugs of Pimms and real ale from the outside bar. Local singer, songwriter and all round brilliant guy Howard Dee then took to the stage to perform a set of acoustic covers and material from his album, Unfulfilled Finale, available on iTunes. Unfortunately, the sky began to darken and the threatened thunderstorm arrived resulting in Howard having to finish his set early as the deluge of rain started to impinge on the outside electric supply. We feel really sorry for Howard and can't thank him enough for carrying on despite the dreadful conditions but the wet weather didn't dampen the party atmosphere with party-goers finding shelter. Our wonderful chefs, Tim and Jim, were flipping burgers and sausages all afternoon cooking up a healthy profit for the charity. Grant, Marc, Beef and Dave were working full on restocking the bar, collecting and washing glasses plus selling raffle tickets. A special mention to all of our volunteers and artistes who gave up their time to assist us in what everyone has described as "the best Party in the Pub so far". You are all superstars!! Wheaty pop princess and singing sensation Nikki Aston then sung her heart out in the main bar keeping the party atmosphere in full swing with patrons dancing both inside and out in the beer garden. Nikki's brilliant party set was warmly received by everyone. We'll be writing to all of the local businesses and patrons who kindly donated prizes into our charity raffle and auction to thank them for their contribution in making the day a great success. A final mention to Sam, Tom and Lee who worked tirelessly hard behind the bar all day. The 3 of you did an amazing job! So there we have it,. Party in the Pub 2015 done and dusted! 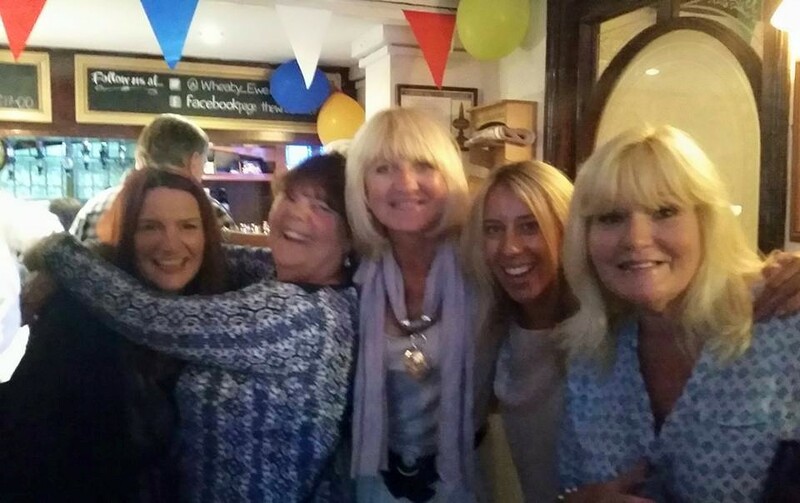 Party in the Pub 2014 raised a whopping £4.000 for the Epsom Medical Equipment Fund. 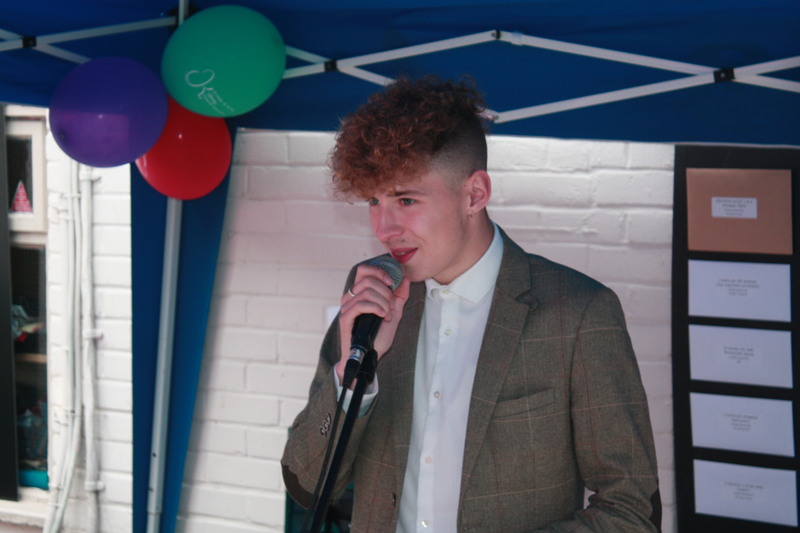 A huge thanks to our live performers 'Everwhile', Josh Bolt' and 'Nikki Aston' who entertained the crowds all day. 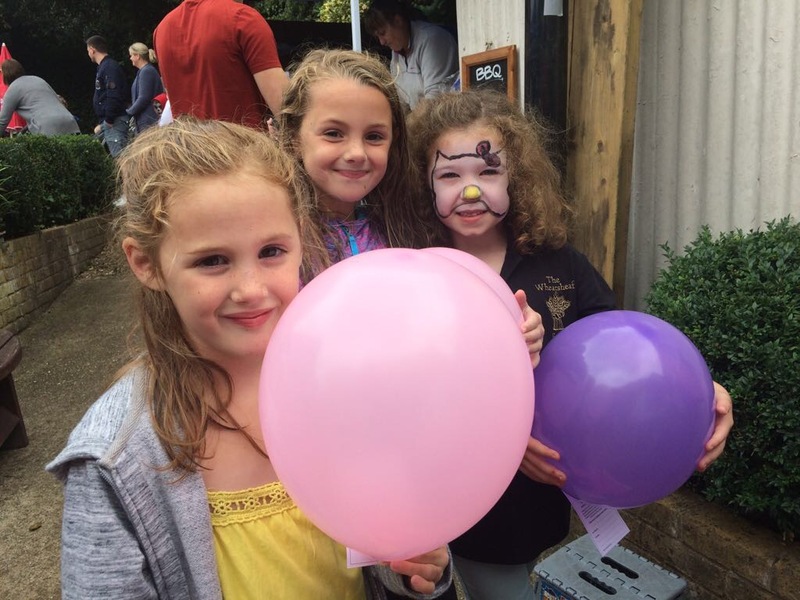 Thanks also to everyone who came and supported the event and purchased raffle tickets, cakes, BBQ and had their faces painted. The money raised was used to purchase a baby heart probe for Epsom General Hospital.